Every Christmas Sharon and I set up a large Christmas village. And over the years I have collected many Santa figures to go in it. I have one plotting his course, there is one playing with elves on a teeter-totter, I have one skiing, I have one checking his list…you get the idea. 26 Santa figures in all. Obviously I cannot place them all out at one time, so what I do, is every morning before Nora wakes up I swap out a Santa. She is under the belief that elves come in and do the swapping. She has always looked for evidence of them being there, such as a downed tree or moved pieces. She is always on alert to hear them. Sometimes I forget to change out a Santa and she gets disappointed. I then distract her and then do a secret change out. And a little bit later say I heard something from the village, and there have been a couple of times she says she heard it to. Well yesterday she got a break through! First I need to tell you I did not have anything to do with what she was about to find. This event is actually a little unexplained which makes it that much more fun. I was sitting at my desk working when Nora walked in holding a pair of tweezers and in the grip of them was a small piece of red fabric. When she got closer I thought it looked like a little pointed hat, like that an elf would wear. Initially I thought she had made it. 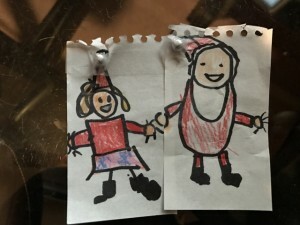 She declared “I found this under the Christmas tree.! I didn’t want to contaminate the evidence, so I grabbed the tweezers.” The only thing better of course would have been finding an Elf shoe. “Good Idea” I told her. 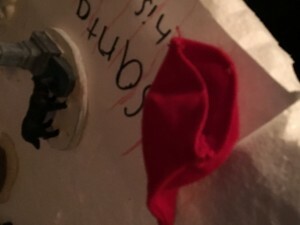 “One of the elves who switched Santa must have left it behind!” She said. 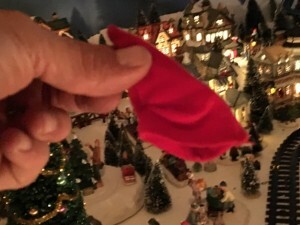 She left out of my office and returned shortly with the hat and a note that read “Elf, is this yours?” She sat the small hat and the note down on the village and wondered what would happen the next morning. Nora has been singing Christmas carols non-stop. With Oh Hanukkah and Deck the Halls being her favorites. So naturally I chose a card with Deck the Halls as the song. As if the Elf had been listening to her and programmed the card herself. She woke up and went straight to check on her note and the hat. She was beside herself when she saw the card had replaced everything. That day she talked and talked about her Elf encounter. She drew a picture of Santa and Clarice that I will hold and cherish forever. I have a feeling this Christmas might be the last with her still believing whole-heartedly in Santa and his elves.